My play therapy inner child scrapbook opened my eyes as to how I have really pushed her aside and have ignored her for so long now.We had ten different activities we had to do in order to make our scrap book. The first play therapy assignment was to write a letter of apology to our inner child. I wrote one and told her that I would consider her feelings more often, and she told me if I did not the she was going to pitch a fit. So, I have to do something everyday to take care of her. Sometimes we color or do other art projects, or we play outside with my children. We will continue to do other activities as time goes by. The second play therapy activity was to have a play date with our inner child. My inner child and I went out with my mom and her inner child. We went shopping because activity number six was to find a toy for our inner child and number seven was to make a special toy box for the things our inner child loves. 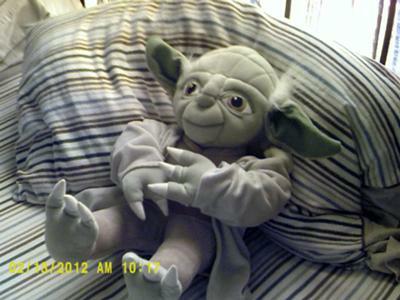 We both bought ourselves a stuffed Yoda. He is so awesome. I also found a box that I loved and got it to use for my toy box. I bought a ton of art supplies for my inner child and for class. We had such a wonderful time. Activity number three was to find an activity that you can do with your inner child every week. I chose to color with my inner child. I bought five small coloring books and two large ones (I had a hard time choosing, so I got them all), so now I will color with her at least once a week. Play therapy activity number four was to reconnect with our inner child’s lost dreams. My inner child always wanted to swim with the dolphins and learn to ride a motorcycle. My dad has always had a motorcycle and I remember how much I used to love to ride with him. I have looked up prices and places to take class in order to learn how to ride and will one day will go do it. I also found places, and cost to swim with the dolphins. I will also be doing that soon. Number five of play therapy assignment was to make a special spot or place for us to hang out. I have chosen my kitchen table because it is the perfect spot to do our art work. We discussed numbers six and seven up above. Getting on to number eight what my inner child likes to collect. I collected dolphins and unicorns, since making my scrapbook I have pulled out my collection from my childhood and placed some of it around my house. Number play therapy assignment nine was to make a piece of art work with our inner child. My inner child and I made a wand and some paper plate art things. And last but not least we had to plan our dream birthday party. Of course, my theme was dolphins. I sent all of the things I found to my mom and told her that in five years when I am forty she has to throw me my dream party. I can’t wait. I had such a good time doing this activity and I now see why I still need my inner child. We will be having a lot of fun from now on in this play therapy class.